This blogpost is being written to publicly thank the Amherst Fire Department and especially Chief Tim Nelson and Captain Jeff Olmstead and the EMTs for the wonderful tour of the North Amherst Fire Station this past Tuesday for my Humanitarian Logistics and Healthcare class. Our beautiful town of Amherst has two fire stations, one aging one downtown, and a newer one, but still decades old that is located on the corner of East Pleasant Street and Eastman Lane, a short trip down a hill to UMass Amherst, which is the one that we toured. In teaching this class I host guest speakers since students need to hear from top practitioners. Having a field trip was extra special and kudos to the students who showed up bright and early at 8:30AM for the tour. Amazingly, during the 75 minute session there were no fire or ambulance calls! We had an overview from the Chief and Captain with inputs from the EMTs. The nearest hospital is in Northampton which is a good 20 minute drive from UMass over a bridge. Technology has expedited the ambulance driving time since the EMTs can change the traffic lights but sometimes the sensors do not work correctly because of wind or snow. The amazing work that our fire department does should be lauded. 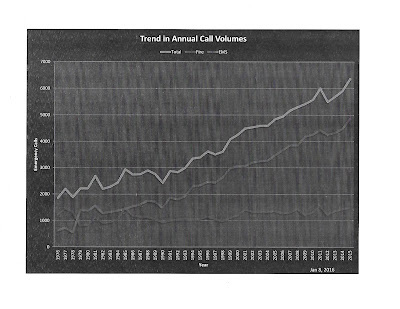 They have had only one new hire since 1976, but with a threefold increase in terms of annual calls, they clearly should be provided with more staff/support! Citizens turn to them in the case of flooded basements, burst pipes, power outages, illnesses, and even having cats rescued from trees (which our neighbors did and that was a day to remember), not to mention ambulance calls and, of course, fires, which happen in our community and at UMass. I remember fires caused by lit candles in a dormitory just a few years ago, for example. Our neighborhood has seen its share of ambulance runs as well. The Amherst Fire Department also assists in calls and emergencies in several neighboring towns and is responsible for an area of about 125 square miles, if you include ambulance service. They work in 24 hour shifts with one day off, one day on, and then five days off. The esprit de corps and camaraderie that they have for one another was evident. One of the EMTs was saying how they make dinner in a crockpot so the team members can eat when they can. They work closely with the UMass Amherst and town police and were busy even last Monday when Bernie Sanders had a rally at the Mullins Center. We even got to hear about disaster communications and that if you call 911 on a cell phone, you will reach a dispatcher in Northampton. If you call via a landline phone and use Verizon you will get the Amherst dispatcher who is, of course, better informed about locations in the community, terms, etc. When one says "campus pond" in Amherst it is the UMass pond and when one hears of the Notch, which they have to rescue hikers from who get lost or enjoyed regularly, then the local dispatcher knows this location south of downtown Amherst. We were told that the fire department plans "for the unplanned" and are engaging more in analytics. We got to meet the "Numbers Guy," who provided us with multiple tables and facts. UMass Amherst relies on them for preparing for a spectrum of special events, which can include anything from rock concerts to major student spring parties. The fire department team members truly care about the citizens of our town and students and are responsible for saving lives every single day. I thank them for the tremendous work that they do and for their selflessness. Many have to work an additional 33% to cover the needs because of staff shortages.Their emphasis on having multiple skills and being efficient and responding to events and calls quickly resonated with the students and me since this is an Operations Management course. The Fire Chief has sometimes taken the fire truck for safety checks, just in case the fire truck would be needed for a call. It would be quicker to have the firetruck available than to have to drive back to the station and get it. The Amherst Fire Department members are true Hometown Heroes and deserve more resources and support. I am so grateful to Fire Chief Tim Nelson and to Captain Jeff Olmstead for taking the time out of their incredibly busy schedules to provide such valuable educational lessons for my students. Plus, we even got to see the firetrucks - ladders only go up to about 7 stories and we do have some very tall buildings, especially our Tower Library at UMass. Sprinklers are essential and lifesavers we were told in such and many other buildings. 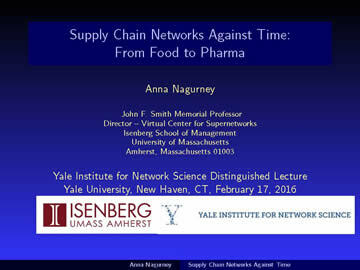 Yesterday I had the great pleasure and honor of delivering a Distinguished Lecture at the Yale Institute for Network Science (YINS). 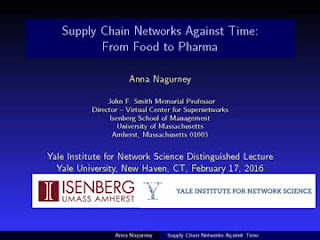 The title of my presentation was: Supply Chain Networks Against Time: From Food to Pharma. I had been invited to speak at Yale by the Co-Directors of YINS, Professors Nicholas Christakis and Daniel Spielman, and was delighted to be introduced by the INFORMS President, the one and only Professor Ed Kaplan, whose latest column is a must read. YINS is thriving under the visionary leadership of Christakis and Spielman. The wonderful attention to detail surrounding my visit I am most grateful for and extend special thanks to Ms. Emily Hau. Not only did I have an office, but there was even a welcome sign and even gifts. Plus, there was a luncheon spread that the audience could indulge in before and during my talk, which was videotaped. The lecture took place on the third floor of 17 Hillhouse Avenue on the Yale University campus. Professor Ed Kaplan introduced me. 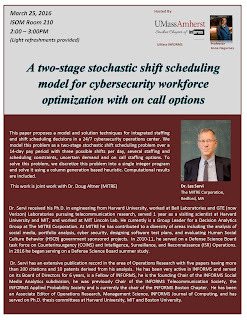 Given the composition of the affiliated faculty, postdocs, and students of YINS, which include not only MDs but also PhDs from disciplines such as computer science, sociology, operations research, electrical and computer engineering, biology, public health, as well as other (all lovers of networks), I wanted to make sure that the topics I covered would appeal to such a broad audience. A delightful surprise during my presentation was having Cyrus, the YINS mascot, a highly intelligent German Shepherd who loves chasing after laser beams of remote pointers, show up o make a command appearance right next to me! I had to have a photo taken with him. After my presentation I enjoyed speaking to faculty and students and had additional appointments even with MD/PhDs, a sociology professor, and a postdoc in Electrical and Computer Engineering. The day was filled with intellectual delights - from discussions on network models of the shared economy and new currencies to supply chains of pharmaceuticals in Africa - I wish that the day would not end. And then to make a perfect ending to a fabulous day, we had dinner at the Union League Cafe. Walking through the Yale University campus was also a highlight of the day. The ambience at the restaurant was perfect - with marble columns and Tiffany glass windows and the company magnificent - Professors Daniel Spielman, Ed Kaplan, and Leandros Tassiulas. I marvel at what YINS has accomplished and look forward to its continuing growth and the breaking down of barriers between disciplines through Network Science and the building of new communities. Congratulations and thanks to its outstanding Directors: Professors Christakis and Spielman. And I was even given souvenirs! This morning, in my email, I had a message from the Harvard Gazette (I was a Radcliffe Institute Science Fellow in 2005-2006 so I am officially a Harvard alumna and enjoy lots of mailings, etc., from Harvard University). In the email there was a link to an article, which reminded me that Valentine's Day is only two days away. 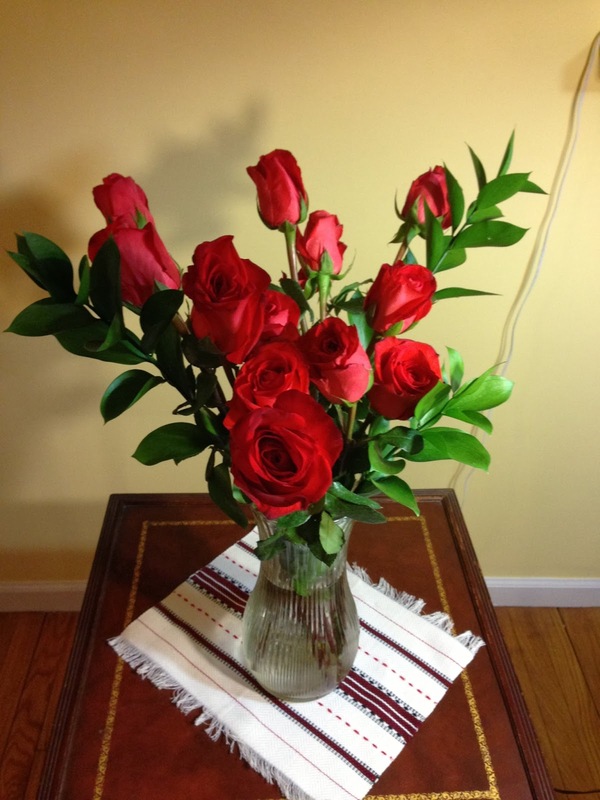 This weekend, including Sunday, the weather forecast is for dangerously low temperatures in Massachusetts and the east coast but at least Valentine's Day should warm us up. — Never assume anything about each other. — And, last but not least, open a joint bank account. One of our doctoral students in Management Science at the Isenberg School pointed out the following article to me by two Emory University professors: ‘A Diamond is Forever’ and Other Fairy Tales: The Relationship between Wedding Expenses and Marriage Duration. The authors evaluated the association between wedding spending and marriage duration using data from a survey of over 3,000 ever-married persons in the United States. Controlling for a number of demographic and relationship characteristics, they found evidence that marriage duration is inversely associated with spending on the engagement ring and wedding ceremony. So for all those in the process of planning a wedding, you may wish to heed this advice. This study generated, as one would expect, a lot of publicity. When it comes to Operations Research and Valentine's Day, I point you to a post that I wrote on roses and logistics in which I also included a link to PunkOR blogger Dr. Laura Mclay's roundup post on operations research models for finding love. Earlier, I had written a post on Optimizing the Marriage Market based on a paper with the same title published in the European Journal of Operational Research Researchers in Switzerland and England developed a mathematical model whose solution yields a new social optimum as to who should be married to whom based on a longitudinal dataset in Switzerland. The authors used the linear assignment model. And for all the students working on their PhDs, I also wrote a post for Valentine's Day on loving your thesis and academic genealogy. Today, we had the great pleasure of hosting Mr. Thomas, Lynch, the Director of Security and Emergency Management at Baystate Health in Springfield, Massachusetts. This is a big level 1 trauma hospital, which, on some days, as happened last week with 397 patients, is the busiest hospital in terms of emergency room visits in Massachusetts. He has been the Director of Security at Baystate Health since 1995 and the Chair of the Emergency Management Committee for the Baystate Medical Center since 1997. Prior to his arrival at Baystate, he served for 11 years as the Assistant Director of Security at Mt Sinai Medical Center in Manhattan and also served for 10 years as an officer in the Army Military Police Corps. The title of Mr. Lynch's presentation to my Humanitarian Logistics and Healthcare class was: Healthcare Emergency Management. Mr. Lynch emphasized the very dynamic, integrated process that is used in the hospital setting with an all hazards approach to emergency management. 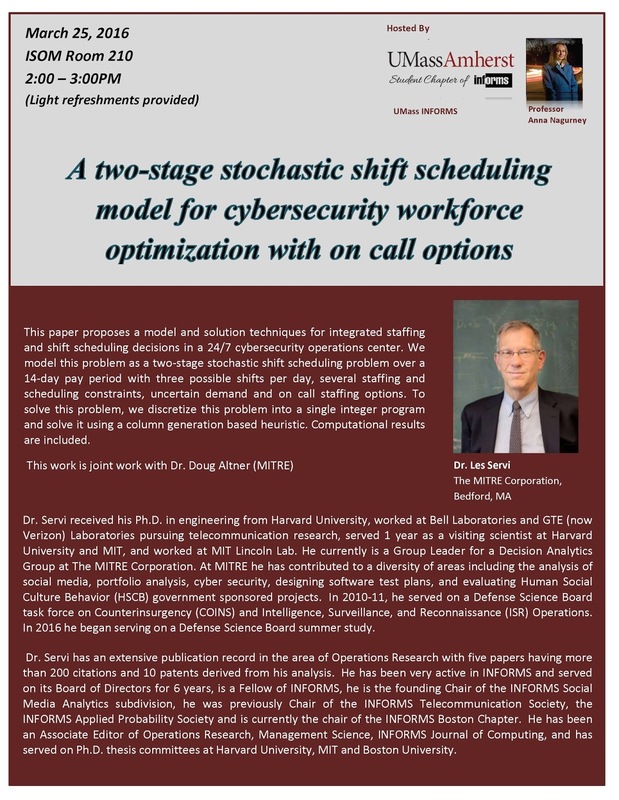 The challenges in such a setting are immense and his team, the hospital staff, and, of course, the medical professionals are constantly drilling and continuously improving their processes. He noted the importance of table top exercises and real drills. He shared with us the following scenario: how an evacuation was handled from an Operating Room during surgery because there was smoke. Practicing fire drills had helped and the patient that was being operated on was moved safely to another room and the surgery completed. Think of the associated issues of sterility, for example. Mr. Lynch shared with us his wealth of experiences including the handling of VIP patients while he worked at Mt. Sinai Hospital in Manhattan. The VIPs, patients at separate times, included a close relative of the Saudi king and a renowned Orthodox rabbi, whose supporters created surges. It was interesting to see, given that it was July, that there were men in raincoats around the hospital for the former (clearly with armaments beneath). He emphasized all phases of disaster management, which we have been covering in class, and especially risk mitigation and the lessening of exposure to risk, with preparation and planning so that you can adequately respond. He said that more efforts should be spent on recovery. He noted how hospitals are accredited and the accrediting body shows up unannounced every three years (a bit different from the forthcoming AACSB team visit for the accreditation of our business school later this month). He also noted that Baystate Health in Springfield is one of three designated Ebola treatment units in Massachusetts and that unit is now complete after 1 1/2 years of planning and work. Federal law requires that patients are treated according to the EMT law and the medical center has to prepare for surges of patients, as well. Sometimes, police assist in stopping influxes at the perimeter because there are only so many patients that can be handled. He spoke of surges, post 9/11, due to fears about anthrax. At times, when there are casualties family members and friends can also cause congestion in the emergency rooms. He emphasized "serving the most people that you can save" when it comes to a hospital evacuation and, ideally, one hopes just for a horizontal evacuation - to another part of the building, for example, rather than a vertical one (down stars). He mentioned a flood in Houston a few years back during which it took 8 staff members to carry patients down 6 flights of stairs. We've learned from Superstorm Sandy that generators should not be in basements, which can flood. 3. Take care of property. One has to manage the disaster and keep the hospital running, too. By federal law, a hospital is required to be self-sufficient, post a disaster, for 96 hours. Mr. Lynch also noted the criticality of Medicare and Medicaid for the financial survival of a hospital and that immediately after an incident, the team gets together and identifies what can be done better. The focus on continuous improvement, I am sure, resonated with the Operations and Information Management and Industrial Engineering students in the class. He noted that similar incidents continue to happen so one must learn and improve and that could include getting a badge maker on site so that you can identify people promptly. He also told the class that relationships matter with your partners and it makes matters so much easier and more seamless if you have good working relationships with the police and fire departments, the Department of Public Health, and also Homeland Security. He also emphasized that the Public Affairs department is crucial in dealing with the media since a hospital's reputation is very important. The incidents that one worries about are so different from issues in the commercial space: mass casualties, which the hospital deals with on a regular basis, infant abductions, and, of course, surges, cases of violence, etc. I was also impressed that the incident commander can change from incident to incident depending on the situation and even time of day. The Chief Operation Officer, who is a female, would be in charge of many emergencies but the VP of Facilities would be in charge of those having to do with his responsibilities. At night, an administrator would be on call. Mr. Lynch's presentation was very informative and fascinating and I am so grateful that such a professional would take tie out of his very busy schedule to share his experiences with my students. Having such guest speakers is invaluable for education. His lecture can be downloaded here. Hosting Great Speakers at the Isenberg School This Semester! The Spring semester is off to a great start. One of the highlights, I find, of each semester, is the speakers that we bring to campus, which enhance the education of our students and even the faculty. Also, the provide novel networking opportunities. Sometimes the logistics of scheduling speakers can be challenging since the one inviting should also be present. This semester I have made commitments to speak at Yale University, the Mitre Corporation, the University of Buffalo, and Carnegie Mellon University. 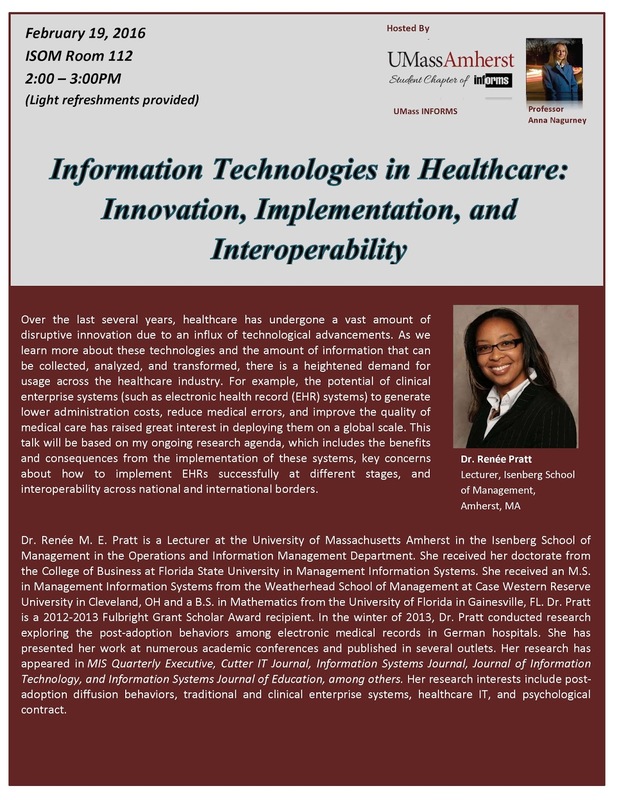 I am also hosting speakers through our UMass Amherst INFORMS Speaker Series plus speakers in my course on Humanitarian Logistics and Healthcare class. 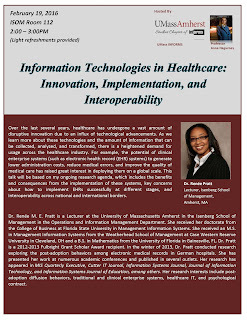 Through the UMass Amherst INFORMS Speaker Series, we have three, already confirmed, great speakers: Dr. Renee Pratt of the Isenberg School, Dr. Michael Johnson of UMass Boston, and Dr. Les Servi of MITRE. The students of the award-winning UMass Amherst INFORMS Student Chapter, which I have been the Faculty Advisor of for 12 years, help out with the logistics and the advertising of these talks. They prepared the nice posters below. Dr. Michael Johnson will be speaking on March 4, 2016, and his topic will be Community-Based Operations Research. Once we receive all the information on his presentation, we will disseminate. Dr. Johnson is behind the terrific INFORMS initiative: Pro Bono Analytics. With topics this semester such as Information Technology and Healthcare, Community-Based Operations Research, and Cybersecurity, I am sure that the talks and the discussions with the audience will be very stimulating and engaging! Lt Col James G. Bishop, Lt Chief, Public Affairs, Westover Air Reserve Base. We will also have Skyping in Mr. Ken Hundemer, Director of Operations for the Denton Amendment Humanitarian Assistance Program, located at Charleston Air Force Base, SC. The above speakers are part of our Professor for a Day initiative at the Isenberg School. Looking forward to all of our guest speakers! After teaching two classes today, I had the pleasure of attending Professor Samuel Bowles' lecture on "The Origins and Future of Economic Inequality." Appropriately, Sam Bowles was giving the inaugural Samuel Bowles lecture. He is a renowned economist and is a UMass Amherst Professor Emeritus. He is now heading the behavioral sciences program of the Santa Fe Institute. After 40 years at UMass Amherst he also had an affiliation with the University of Siena in Italy. I figured that the lecture would be standing room only so I got there early and it was wonderful to even see Bowles' long-time collaborator, and also a former UMass Amherst Professor, Herb Gintis. I have had the pleasure of seeing Herb at a workshop in Hawaii, at which we were both invited speakers (and all our expenses were paid) and also at a conference at the University of Maryland. And, as I mentioned to him today, when I arrived in Gothenburg, Sweden in my apartment there as a Visiting Professor last Spring, I turned on the television and there was Herb being interviewed! No wonder I always feel so at home in Sweden! I could not resist taking a photo of Herb Gintis featured above. Professor Bowles was introduced by Professor Michael Ash of the UMass Amherst Economics Department. We had hosted Professor Bowles back in 2009 in our UMass Amherst INFORMS Speaker Series. He was mesmerizing then and today as well. Bowles spoke about his data-driven research to identify why there is economic inequality and his research tackles problems over centuries. He noted how, as a student in a school in New Delhi, India, he struggled with trying to understand why people were so similar and yet some suffered from poverty. After being denied tenure at Harvard he decided that he "would either leave economics or change economics" and he has been doing the latter ever since. Luckily, we had him at UMass Amherst for 40 years. Harvard's loss was our and the world's gain! He is fascinated (and who is not) by such questions as why inequality may persist and intensify and on what does a more egalitarian future depend. He described mobile hunter gatherers for whom cooperation was an essential part of their livelihood and brought out the kudu (featured below). Since there were no refrigerators and kudu meat is perishable the society would divide up the parts of the kudu and would share. It would be wasteful not to share. Land ownership, which is associated with hierarchical structures, rather than egalitarian ones, changed societies and wealth holdings. Inequality took place because of the rise in wealth that could be stored and inherited. Hence, farming also played a role in economic inequality. Fascinatingly, Bowles noted that the wealth of hunters gatherers was knowledge and networks! Public speaking was important because you had to convince others. Some would walk for miles to interact with others as an "insurance network," a phrase that resonated with me. The inheritance of material wealth was becoming much greater than the inheritance of human capacity and hunters gatherers took many years to acquire their skills and knowledge. He spoke of the Gini coefficient with a value of 0 signifying perfect equality and a value of 1 corresponding to ownership of 1. He also presented graphs of Gini coefficients for different countries and, of course, some of my favorite ones - the Nordic countries - were singled out as having low Gini coefficients, so this shows a redistribution of wealth. He also showed Lorenz curves for measuring inequality. He emphasized that knowledge and human capacity now are more important than material wealth. We are past the industrial society and in the knowledge and information-based economy.. How important is material wealth in producing what we need? He presented a math model from a published paper with 4 terms and noted that the cost of redistributing in a society of knowledge, networks, and human capacity may be lower. Of course, he mentioned Thomas Piketty's book, "Capital in the Twenty-First Century." Piketty delivered the Gamble lecture last year at UMass and I blogged about it. Bowles said that he was interested in Human Capital. In the information-based economy, he said that "the winner takes all." No longer is it just the local singer that you may care about but the best singer and songs and the same for apps. He said something quite controversial - that intellectual property should be abolished. He also mentioned that because of the World Wide Web we have a "weightless economy," which I found quite interesting. He also stated that the US because of its great inequality has a huge amount of "guard labor," which is a drain on the economy. I very much appreciated hearing him talk about knowledge, creativity, and networks and educational institutions, such as, of course, the university at which I teach. The Q&A session that followed was great with issues of politics and poverty highlighted. It was definitely a day of intellectual rigor and delights and, interestingly, the material that I covered in my afternoon seminar was an introduction to variational inequalities - a mathematical formulation that contains optimization problems as special cases. So, inequality was definitely the dominant theme for today. Bowles in his summary and conclusions also noted that the politics of redistribution of wealth is extremely important.